Noida: Global Media Summit with delegates from Hungary, Tanzania, Myanmar, Afghanistan, Sudan, Ghana, Thailand, Botswana, Lesotho, Uganda, Zimbabwe, Ethiopia, Papua New Guinea, Syria, Tajikistan, Turkmenistan, Uzbekistan, Bhutan, Nigeria, Bosnia And Herzegovina and India nominated Sandeep Marwah as the World Peace Ambassador. Sandeep Marwah is already the Ambassador of International Human Rights Organization affiliated to United Nations; he is also the President of Association of Asian Union, World Peace Development And Research Foundation and many related organization working towards World Love, Peace and Unity proposed Chandrakant Patil Kharare. Sandeep Marwah deserves to be the World Peace Ambassador who has spent his life in uniting all the countries of the World through art and culture. His latest venture of International Chamber of Media And Entertainment Industry also propagates love, Peace and unity through art and culture. ICMEI has 162 international committees, 80 national committees and contact office in 110 countries of the World. A unanimous decision of nominating him again as the World Peace Ambassador was taken in the summit. H.E. 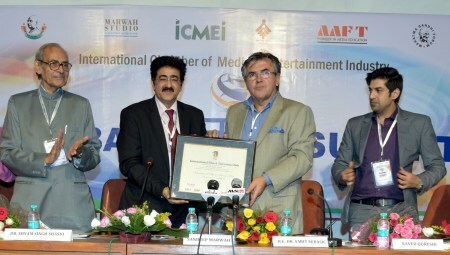 Dr. Sabit Subasic Ambassador of Bosnia and Herzegovina and Padmashri Dr. Shyam Singh Shashi congratulated Sandeep Marwah. â€œThe works of Sandeep Marwah are on the lines of Mahatma Gandhi, Nelson Mandela, Dalai Lama and other World leaders. I wish him all the best in his endeavorâ€added Dr. Shyam Singh Shashi.